UCOG Today [Paul Kieffer] » Blog Archive » We go "anti-septic"
48 years after my father-in-law built his house in Mobile, Alabama, he got a hook-up to the Mobile city sewer system. The house is well within city limits and sewer service has been available within the neighborhood (less than a quarter mile away across a creek) for years, but some reason my father-in-law’s house (and the other 4 houses nearby) were not offered a sewer line extension until my sister-in-law got involved. She and her husband have built a house next door, and a couple of years before construction began she started petitioning the city for an extension of the sewer line. Like the Bible story of the persistent widow with the unrighteous judge, she prevailed. Last summer the city extended the line to our two houses, and now the house is hooked up to the line. 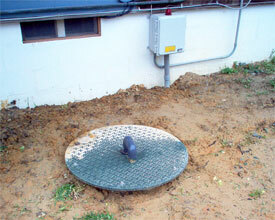 The plumber (a husband and wife) team took a day to install the tank and grinder and unhook the old septic tank. The tank is about 75 feet from the sewer line, and the plumber tells me that the pump is strong enough to pump up a 20 foot differential. The only challenge will be power outages, since the grinder and pump obviously need electricity to work, but so does our water pump (we don’t have city water, just the city sewer hook-up). We have a few months to work that out before hurricane season this summer.